Evidence that ancient Greek civilization possessed advanced technology beyond the Antikythera mechanism, the earliest complex mechanical instrument, used for calculating the movements of the stars and predicting solar and lunar eclipses - in short, a prototype computer - has been strengthened by the discovery of a laptop computer depicted on an ancient Greek vase. 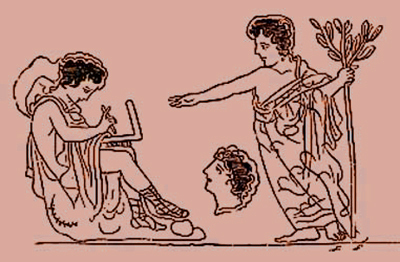 The image is of the Oracle of Orpheus, the head of Orpheus offering prophecies to a young man who records the predictions on his laptop while Apollo observes at right. Identified on the vase as μήλο φορητό υπολογιστή, tech-anthropologists have yet to discern how the device's mechanism worked; there is no visible evidence of power cord or battery. The young man appears to be operating a crude pedal with his right foot, apparently the source for power generation. It's a quarter to three, there's no one in the shrine 'cept you and me. So set 'em up Zeus, I gotta little story that ends in a noose. Orpheus rejected worship of all Gods except the sun, whom he called Apollo. But even Apollo had his limits and after listening to the Oracle of Orpheus until he couldn't stand it any longer, gave Orpheus the hook and shut his mouth. Here, Apollo seems to be saying, "Hey, I want one of those things!" It is entirely possible that this vase and its message went ancient-world viral. In a telling detail, the young man is using a stylus to depress the computer's keys, conclusively demonstrating that from the very beginning laptop makers presumed everyone had toothpick fingers able to navigate a cramped keyboard design inspired by canned sardines. Amazing !! Wi-Fi available that long ago!